Looking to install cubicle hardware and don’t know where to start? Then start here with part 1 of our 4 part guide to help you determine exactly what you need! The first thing you need is a partition. Perhaps most commonly used is Compact Grade Laminate (CGL) which measures 13mm in thickness overall, therefore occupying minimal space. This medium is both cost-effective and offers a water-resistant finish, making CGL a fantastic choice for installing in wet areas such as shower cubicles. Melamine Faced Clipboard (MFG) is a thicker alternative to CGL, measuring 20mm in thickness overall and therefore offering a more substantial divide between cubicles, but is less efficient in wet areas than CGL. For those requiring a high-end solution for luxury facilities, solid grade laminate or contemporary glass partitions can be fitted in place of these. 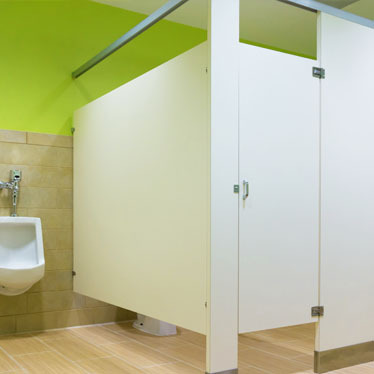 It is important to establish the material of your partition before choosing cubicle hardware. Fittings are most commonly available in stainless steel and aluminium. First consider the purpose of your facilities, particularly when fitting your partition in wet areas containing showers or sinks as this will help you to determine the best material to choose for your fittings. In wet areas such as shower rooms, it is advisable to install grade 316 stainless steel as it offers a higher level of protection against the elements. Remember however that stainless steel is not water resistant and will still require maintaining despite the quality and grade of the steel you are using. Polished stainless steel finishes are often easier to maintain due to having a plain rather than textured surface, but can require regular polishing in areas of frequent use as finger marks can often be seen where the item has been handled. Aluminium also offers a high level of water resistance and is an ideal solution for those on a budget. For those fitting cubicle hardware onto a glass partition, you will need to ensure you are using suitable fittings that will sufficiently cushion the glass surface and protect the partition from breaking. Read part 2 'Cubicle Brackets and Headrail' of our 4-part blog for information on choosing the best brackets and headrail for your cubicles!